A very tasty treat indeed! Enjoy! Add all the other batter ingredients and stir well with a whisk, to remove any lumps. Let the batter rest in the fridge for at least an hour before making the crepes to allow the mixture to settle. To cook the crêpes, heat a little butter in a crêpe pan or non-stick pan. Cook on both sides until lightly browned. Slide it out of the pan onto a warmed plate and keep warm as you make the rest. To make the sauce, put the butter in a small pan, add the sugar and whisk rapidly. Add in the Grand Marnier or Cointreau, the orange zest and juice. Bring to the boil, stirring continuously, then cook briskly until the sauce thickens. To serve, pour the sauce into a frying pan over a low heat. Put the crêpes in the sauce one at a time, folding them once, and then again, to make little triangles. Spoon the sauce over the crêpes to make sure they are all soaked with sauce. 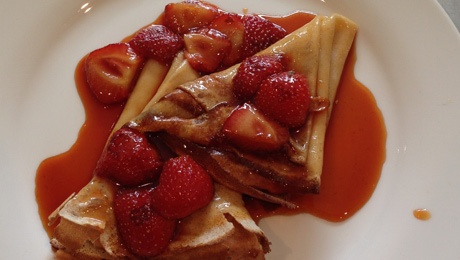 After the flamed has been extinguished add the strawberries, heat through and serve immediately with the crepe suzettes and some Vanilla Cream.